Full size pickups that are without V8s? 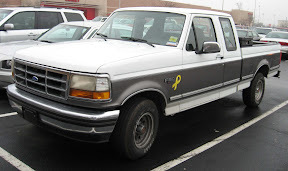 A Ford F150 with a V6? Heresy! Image from Wikimedia Commons. There are some things which truly are as American as apple pie (although apple pie is not an American invention at all). One of those things is full size pickup trucks that have big, beefy, 8-cylinder engines. Trucks are the tool of the working man (and woman) and by Jove, trucks should come stock with enough horsepower to handle just about anything. However, in line with a recent trend in smaller cars, Ford is about to roll out a new line of the F-150 that comes stock with a V-6. Next year, Ford is going to roll out a new F-150 with a turbocharged V-6. Fuel efficiency is a concern, and a valid one, that is all the rage these days. The 6-cylinder model is projected to pump out 300 horsepower and get 20 percent better gas mileage, according to the Wall Street Journal. However, the new “Ecoboost” turbocharged V-6 will come with a premium, as it will cost more than the base model V-8. How much more is likely to be the lynchpin at dealerships. Toyota is also planning to offer a V6 in the 2011 Tundra. To be fair, some full size pickup trucks have come equipped with a 6-cylinder engine in the past. Chevrolet, GMC and Dodge all have half ton pickups that actually have 6-cylinder inline or V-6 engines in the base model. Sales for the F-series pickups, far and away the most popular full size trucks in America for decades, are up almost 35 percent so far this year. However, not many people seek out a full size pickup with a 6-cylinder. Most of those models end up being used for fleet applications such as construction or landscaping. One of the trends among automakers over the last three decades has been to put a smaller engine in a vehicle, and then turbocharge it. Fewer 8-cylinder engines are used in passenger vehicles in order to keep horsepower high along with gas mileage. It isn’t the worst idea, either. The owner can enjoy the best of both worlds.